Now you can play the two most popular digital audio formats with a single portable device. 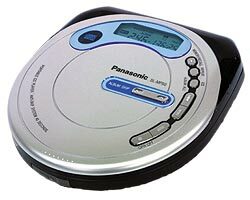 The Panasonic SL-MP50 combines a CD player with an MP3 player that plays back 5 inch CD-R or CD-RW MP3 disks. Anti-Skip ability -- physical design combined with electronic technology help to absorb smaller shocks and quickly deal with larger shocks that could cause music "skips"
For each audio format, the Panasonic SL-MP50 provides similar capabilities such as Skip, Random Play, Repeat play and Random programming. Digital servo system detects fractional track errors and corrects them before getting completely "off track"
While these are excellent specs, music could still be silenced (briefly) during the recovery period. To deal with this, Panasonic engineers have added a 40 second memory back-up that starts to play until the tracking error is corrected. During MP3 playback, this buffer is extended to 100 seconds (with 128 kbps audio compression). The Panasonic SL-MP50 includes stereo headphones and lists for $139.95. It will be available in October 2001.